No two weddings are alike and in this beautiful beach destination wedding, Chad and Devyn traveled from New Orleans, Louisiana to wed at the breath-taking Paradise Cove, in Orlando, Florida. With the backdrop of a private lake and sandy beach; surrounded by lush tropical floage and towering palm trees it was amazing. She and nurse and he a small business own, met while attending college at Louisiana Stat University in Baton Rouge. 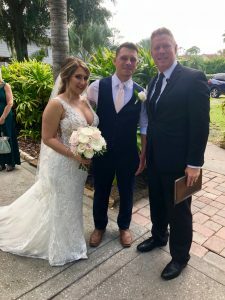 With a beautiful sunny day that felt like Fall in Central Florida, the couple tied the knot in a custom ceremony created with the help of Rev.Glynn Ferguson with Sensational Ceremonies. With touches like the Art of Marriage and The Irish Wedding Blessing it was a heart-felt ceremony that fit the two of them. Dominico Castaldo of Castaldo Studios captured this touching intimate wedding ceremony from the bride getting ready to the cutting of the wedding cake. Vinny with Your Orlando DJ provided mics for the ceremony, while harpist Christine MacPhail played their favorite songs as they walked down the aisle. Jasmine with Paradise Cove coordinated the entire event and Cocktails Catering took care of the refreshments for the couple and their guests.